This is our beautiful son Jaxon; his smile will capture your heart. the first 18 months of his life in an orphanage. 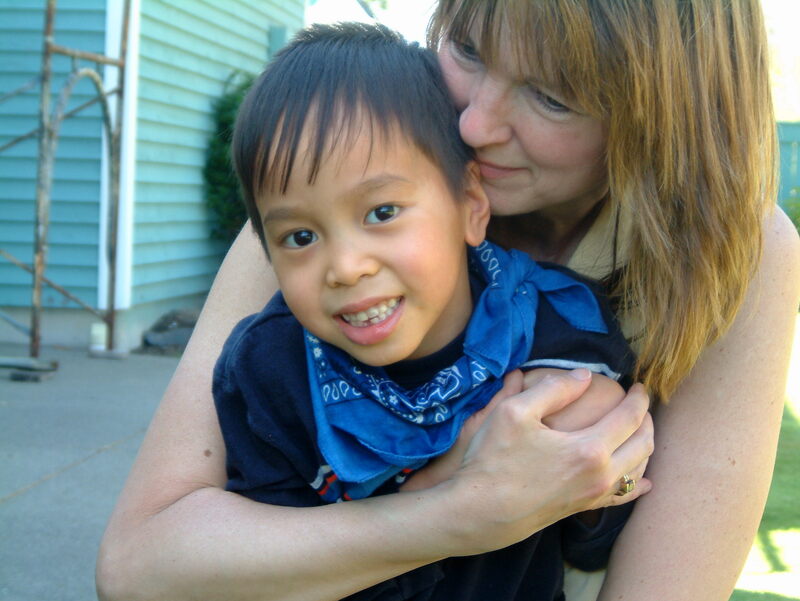 In 2001 he was referred to us by our adoption agency, we were elated and couldn’t get him in our arms fast enough. This was the beginning of a match made in heaven. We quickly bonded and watched Jax grow into a sweet loving, smart, kind, happy and very active boy . . . life was wonderful. Then one day in February 2006 after a great day in Kindergarten, Jax had some difficulty talking and his head was nodding/dropping forward like a quick nod every 3 – 5 seconds. We were very concerned. After an appointment with his pediatrician, it was thought to be a form of seizure and we were referred to a pediatric neurologist. The next 4 months were spent in and out of hospitals, numerous tests were done and many different drugs were tried as his condition worsened . 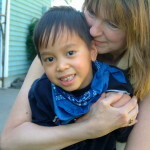 . . worsened to the point that the “seizures” prevented him from walking and his speech all together stopped. He was so weak that he could no longer hold himself up. He couldn’t even hold his head up. He was having difficulty eating, keeping food down, and he cried a lot. The seizures he was experiencing 4 months ago progressed to a more difficult form to control called myoclonic seizures and the medications he was taking were not helping . . . He was deteriorating before our eyes. The doctors were at a loss as to what was causing these seizures and the best diagnosis they came up with was Idiopathic (no known cause) Epilepsy with intractable seizures. We weren’t satisfied with that diagnosis, there had to be a cause. We continued to do research and kept pushing for answers . . . for a cause. We searched the internet trying to match his symptoms with a disease or disorder but found nothing different than what our doctors have already found. We looked back at Jaxon’s medical history and searched if anything he ever had could cause seizures. Jaxon contracted measles at 7 months and found that there was a very rare condition closely matching his symptoms that was caused by the measles virus but we were hoping it wasn’t it. After asking the doctors to re-review his medical history from the Philippines, and after a test of his cerebral spinal fluid and serum, they found the cause of his seizures. The diagnosis we were hoping it was not, was it. They diagnosed Subacute Sclerosing Panencephalitis (SSPE), a chronic persistent infection of the central nervous system caused by the measles virus, specifically an altered form of the measles virus. Once the doctors confirmed the diagnosis we were then told what to expect. We knew what they were going to say but how were we going to tell our son that what he has is almost always fatal within 1-3 years of onset with a 5% chance of remission. And is there any treatment? A challenge for our doctors since no one at Seattle Children’s has ever treated a patient with SSPE so the search was on to find someone that they can consult with for treatment. Research on the internet about SSPE stated that if diagnosed early a delay in clinical progression can occur with therapy using a combination of immunomodulators (interferon) and antivirals (Isoprinosine and ribavirin). When not treated with immunomodulaters and antivirals, SSPE as mentioned earlier is almost always a fatal disease. But were we early enough to prevent further progression and what is the best combination? Will this stop his myoclonic seizures and will he regain his ability to walk, talk and eat? Will we be able to give him a huge hug and get one back? We needed to find an SSPE expert. Our neurologist sent numerous emails to various clinics and organizations looking for someone that has experience treating a patient with SSPE. Her hard work resulted in finding a neurologist in Southern California that treated a number of SSPE patients in the 1990’s and was more than willing to consult with her and with our family. We were so fortunate that our doctor found this expert as he helped immensely in guiding us in the right direction then and still consults with us regularly. We chose to use intraventricular interferon alpha and oral Isoprinosine which meant a surgical procedure to implant an ommaya reservoir on Jaxon’s skull right under the skin and into one of his ventricles. This way the medication will be injected directly into his cerebral spinal fluid. This also made it easy to gather a CSF sample for future testing. Then our neurologist had to request authorization from the FDA to use Isoprinosine since it hasn’t been approved in the US except for certain uses like for the treatment of SSPE. Within a month we were able to start the protocol using the combination of Isoprinosine and interferon. This was the start of our twice weekly trip from Port Orchard to Seattle Children’s to start treatment on what we hoped will prevent further progression of this fatal disease. This was also the start of what has become a long trip towards recovery with more obstacles for us to overcome …. for Jaxon to overcome.